Navarre’s co-owner gives us the down-low on the soon-to-open Luce on East Burnside. John Taboada and Giovanna Parolari are one of those couples you can’t help but admire. He gave Portland Navarre, one of the pioneers of Portland’s eastside scene. Part neighborhood enoteca and part farmhouse, Navarre captures the intangible mystique of a family-run restaurant in Spain, Italy, or France—highly personal, with a rich sense of place. She gave Portland Una, one of the coolest little dress shops in the city on SE Ankeny Street. Now they’re collaborating on a new two-storefront project: Luce. Maybe you’ve heard of it, maybe you haven’t. For a year or so, Luce (Italian for “light”) has been quietly spinning out occasional test dinners and farm-to-table parties. Now it’s set to open later this month on the corner of 21st and East Burnside, with longtime Navarre chef John Willis at the stove. We sat down with Parolari to get a jump on what to expect from people who clearly love food, wine, and design. What is the vision for Luce? Well, there are two spaces: the middle space, which is the event space and the corner space, which will be the restaurant. We hope it will be a comfortable little neighborhood place. Whenever we go to Europe (or certain neighborhoods on the east coast), we always wander into these tiny grocery shops packed to the brim with food and product. People are gathered playing games, eating and drinking all times of the day. You could run in and grab some food or provisions to go, join in on a game or conversation with a little snack and glass of wine, or sit down for a full meal. It will be easy, comfortable and welcoming. What will be eating? Give us a taste. The food will be Italian-based, but no one particular region: a small menu of antipasti, focaccia, soup, salads, pasta, and rotating list of a few specials. We will also have food, wine and home products for sale. Mostly things that excite us or thing that are functional. It will grow as we grow. Navarre draws inspiration from all over Europe. Why did you go Italian? We both love Italy and Italian food. I’m Italian on my dad’s side. I miss my nana’s cooking and big loud family around a table…the simplicity and love that goes into home-cooked meals and the casual elegance of presentation. In short, community. 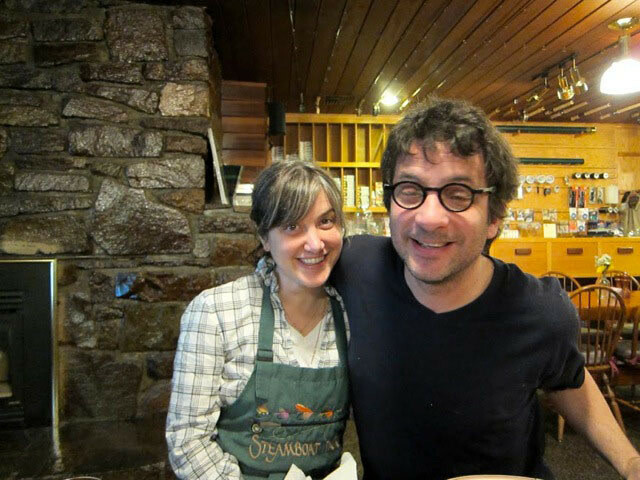 We have a dear friend in Cremona who has inspired us over the years just by including us in meals with family, the house in the mountains, the local apertivo hour at a favorite trattoria… he is the ultimate host. He and his mother are wonderful cooks. Hopefully, we can provide a fraction of that warmth and grace alongside some simple, good food. Where do you fit in between John Taboada and chef John Willis? We all are responsible for the menu. It has been fun to sit with those guys and hash out recipes and look through cookbooks together. John Taboada and I will be doing the wine and product buying. Willis will run the place and make great food. He really cares so much. I think intention is pretty important. Where are you and John eating these days? What restaurants are on you radar? We are all so spoiled, there really are so many wonderful restaurants in Portland. John and I are creatures of habit. The loop goes something like this: Evoe, Castagna Cafe, Gruner, HA & VL, Bar Mingo, and Ya Hala. Recently, we tried and enjoyed Skin & Bones and Bent Brick. Luce, slated to open by the end of July, will be open 7 days a week, 11am to 9pm.